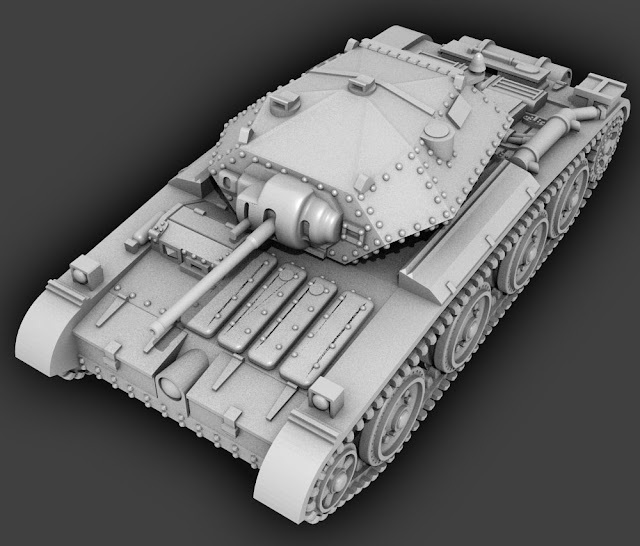 I've re-scaled my model of the Vickers Medium Mk.II*, with improved ventilation for tropical deployment, to 1:56 scale (28mm). Shapeways gets a bit pricey at this size, even in WSF nylon. I don't know how this price compares with resin casts in comparable scales. 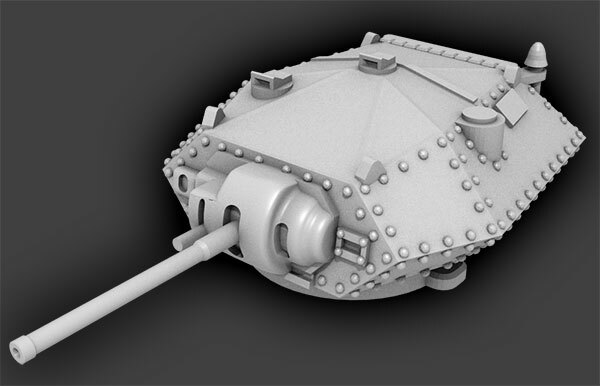 Among the unpainted bits and pieces I've been organising, I found this: the Grant medium tank, from GHQ. 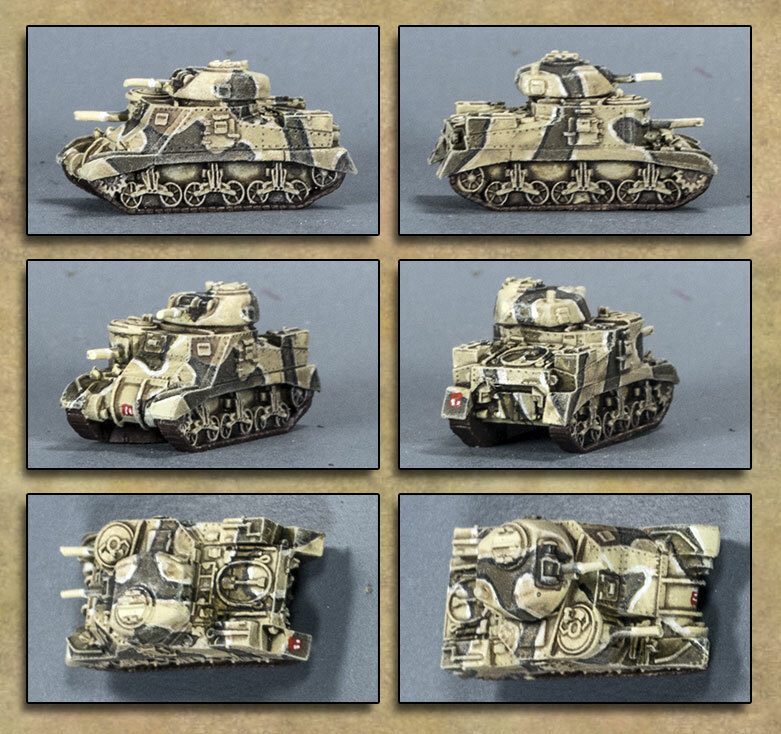 This camouflage scheme is more or less the same as that painted on the example at Bovington, and it's a scheme I rather like, which is why I painted this. It's large swatches of KG#3 outlined in lines of black and white on a Dark Sand base. I experimented with various means of getting the outlines done, but in the end I didn't find any easier or more effective way than just painting on the KG#3 blotches and then outlining them with a fine brush. Now I have four more to paint the same way. And as usual, now that I've photographed it, I see that I've forgotten to paint the various tools and what-not. Not to worry, that's easy enough to fix. I picked these up out of a bargain bin for a couple of bucks quite a few years ago. 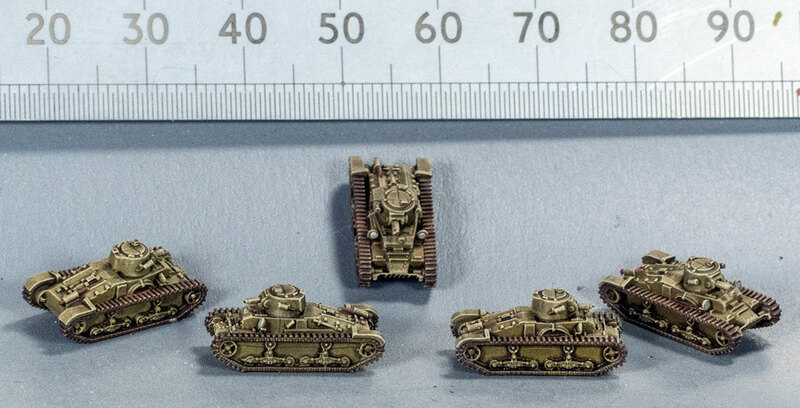 They're for Warmaster, so 10mm scale — in 28mm scale they'd be about the size of a pony, I guess. I have no idea what they're supposed to be; the box just said "Chaos Creatures". They're squatting on beds of skulls and bones which I haven't painted (yet). If I use them for 28mm gaming, those skulls would have to have come from something pretty tiny — some kind of fairies maybe? I'm in the process of organising all my unpainted microarmour, and I'm finding quite a bit of stuff I'd completely forgotten I'd ever bought. 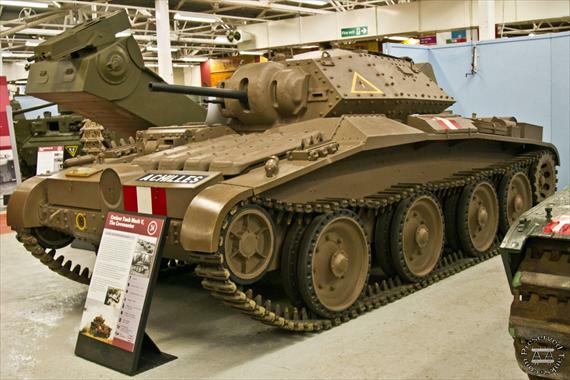 Among them are these Matilda 1, from GHQ. They're tiny little things, and beautifully modelled, but being GHQ they're also pretty bloody expensive — $US10 for five, which (when I bought them) meant about $NZ17, or about $NZ3.40 each. Add on postage, and that brings them up to about six or seven Kiwibucks each. A lot more, if I hadn't bought a bunch of other stuff at the same time, so the postage cost was spread out a bit between them. I have some other Matilda 1, from Scotia. Compared with the GHQ models, their sculpting is fairly... "crude" is a harsh term, but I can't think of anything more appropriate right now. On the other hand, they only cost me about one Kiwi buck apiece, and they're readily identifiable on the wargames table for what they are. Is the extra money for the much better quality of GHQ justified? I'd say that really depends. If all you want are identifiable playing tokens, then I'd say not. 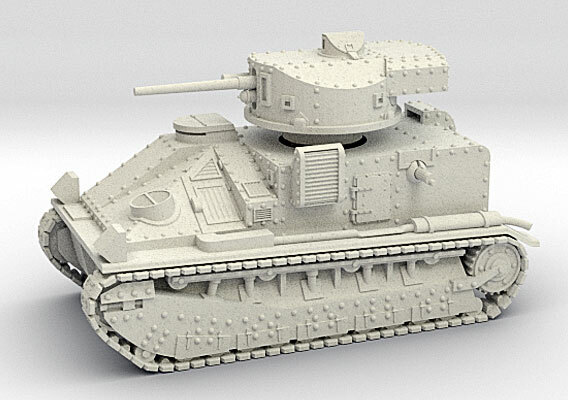 However, if your interest is more in the micro-diorama modelling line, then I'd say definitely yes. 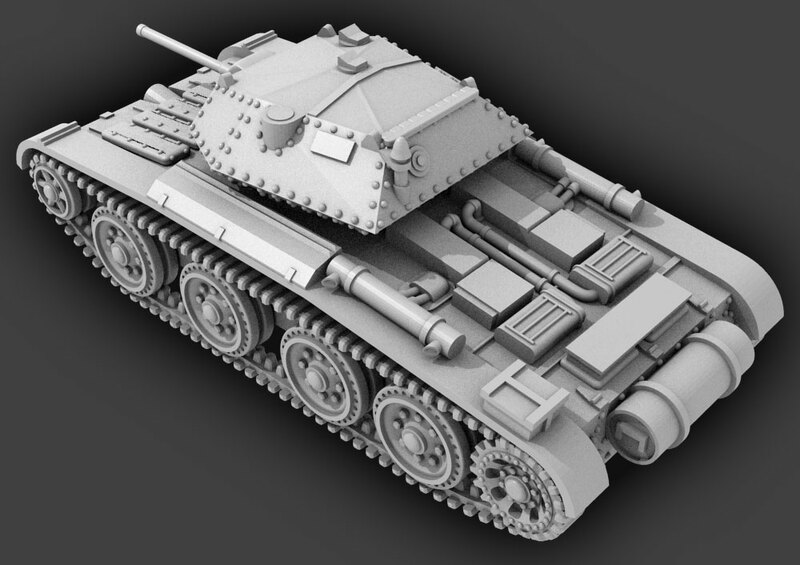 Personally, while I like having exquisitely detailed models on the tabletop, I'm quite willing to settle for less as long as they do actually look like what they're meant to be. And the skyrocketing cost of postage from the USA (which often doubles, or more, the cost of an order) means that, with the high cost of their models, I won't be buying any more GHQ stuff in the foreseeable future. That's kind of a shame. These are Heroics & Ros' new sculpt of the Matilda 1. The detail level and price are comparable with Scotia, though the edges are a little sharper. The proportions are a bit exaggerated vertically, but the profile does give a good visual impression of the dumpiness of this little tank. Here's another figure from the last Reaper Bones Kickstarter — 80002: Deadeye Slim, by Patrick Keith. I wanted a "spaghetti Western" gunfighter, so he's very very dusty and sweaty and almost monochromatic. I also wanted to get him painted very quickly because I didn't want to have to expend too much effort on him, so this is about a 15 minute paint job. This lady is part of the Townsfolk set from the last Reaper Bones kickstarter. She seems very friendly. Possibly one of the Hot Singles in Your Area Keen to Meet You. This is not one of my better paint-jobs; the subtleties of nice smooth skin defeat me. Nevertheless, now she's done. The figure SKU is 77086: Townsfolk: Strumpet by Bobby Jackson, and she's currently selling for $2.49. I've finished my 1:100 scale Blender model of the Covenanter. Now I'm trying to get it uploaded to Shapeways for 3d printing, but for the moment there appear to be issues — the trouble is, I have no idea if the issues are with the model, or with Shapeways' servers, which have been known to crap out fairly frequently, especially when somebody has been trying to make "improvements" to them. Something was bugging me about the proportions of the tank, and I finally put my finger on what it was — the road wheels were riding too high, so it didn't give the exaggerated gap between the running gear and the track-guards that was seen on the actual machine. So, I adjusted that and now it looks a bit better. It could be taken a little further still, but then I'd be running into strength issues in the printed model. So, this will do the trick I think. I'm in the process of building a 1:100 scale digital model of the Covenanter, the immediate (unsuccessful) predecessor of the Crusader cruiser tanks of WWII. 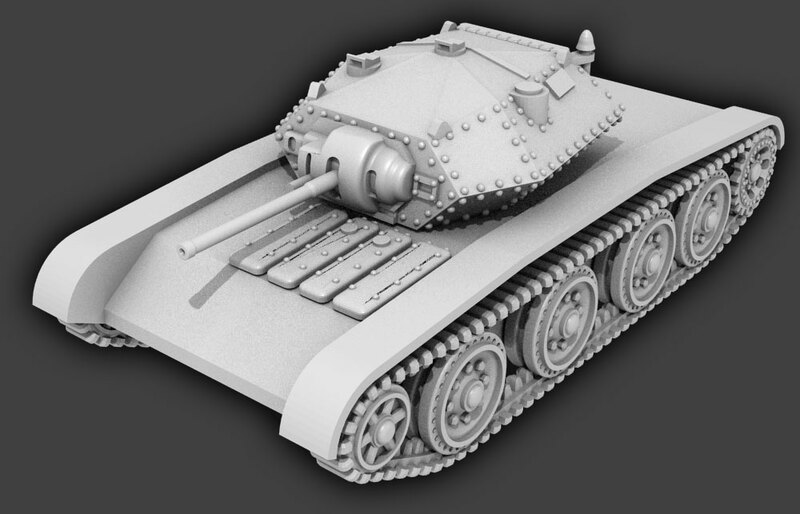 This is a tank of many, many angles, and modelling is not proving to be completely straightforward. At the moment, the gun mantlet is giving me a huge amount of trouble. 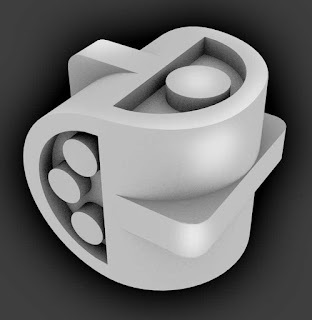 It's a casting, so all the component parts will need to be faired together, but first I have to get the actual profile right, and that's giving me a lot more grief than I thought it would. I think I'll have to scrap what I've done on it so far and start again. The lug you can see at the bottom of the turret is just to hold it to the inside of the hollow hull. 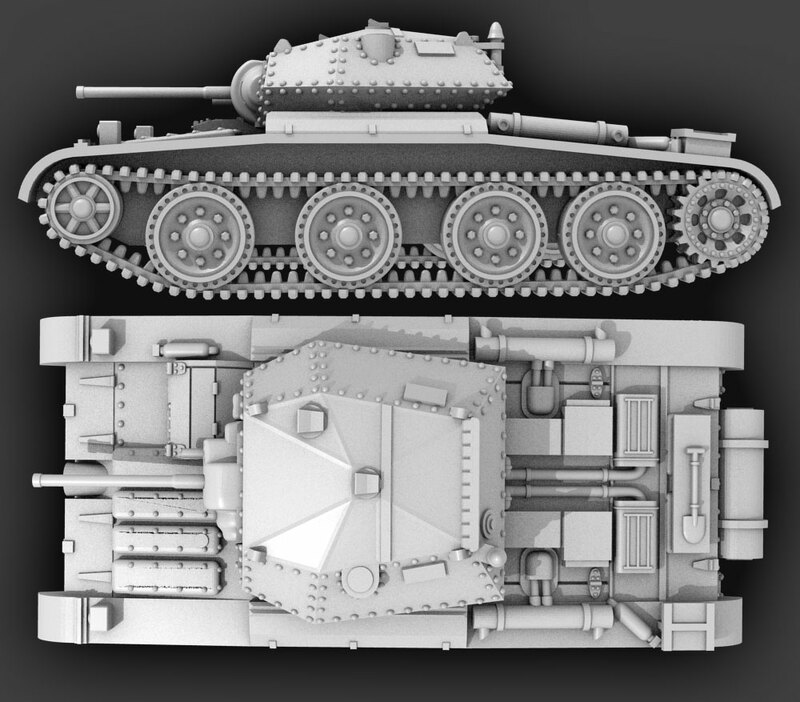 It won't be seen on the assembled model. The mantlet is still far from perfect, but it's a million times better than it was, and certainly good enough for my purposes. Now I've got all the bits and bobs on the turret, and hollowed it out to save on materials when it's printed, and I'll call it finished. Now I can move on to the next bit, which I think will be the various components of the running gear. We've got some wheels, and now I shall have to make some tracks to wrap around them. It's starting to look a bit tankish now. I have the basic shape of the hull and trackguards, and the wheels in place. 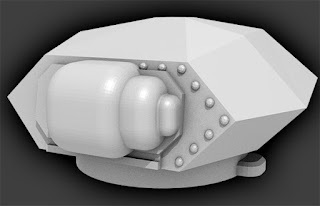 However, I'm going to have to revisit the turret because I forgot about the cut-out beneath the back half which would allow it to rotate over the guards and other assorted clutter. What a nuisance. Still, I have nobody to blame but myself. Running gear is complete, and now I'm making a start on all the crap that clutters up the decks. Those things in front are radiator covers. Things are coming along, and most of the rear deck clutter is done. There are still a few bits and pieces to take care of — hinges, fire extinguishers etc. — but the end is in sight. This is a very old miniature, from Games Workshop I think, which I've had sitting on my desk undercoated for years and years. It came in a blister of two versions: this one, and a mounted figure. It was actually the mounted figure I was looking for when I came to finally get around to painting it, but I couldn't find it, so this guy finally got the treatment. It's designed for a plastic slotta-base, which I hate, so I've mounted him on a 22mm washer and built up the ground with GreenStuff. I briefly considered adding some foliage, but that stuff catches the dust like you wouldn't believe, and is impossible to clean properly. So, he gets to stand on bare rock. I got these four guys in the last Reaper Bones Kickstarter. They're ghasts — a sort of uber-ghoul, for those who don't know D&D monsters. Retail price is about $2.50 each. 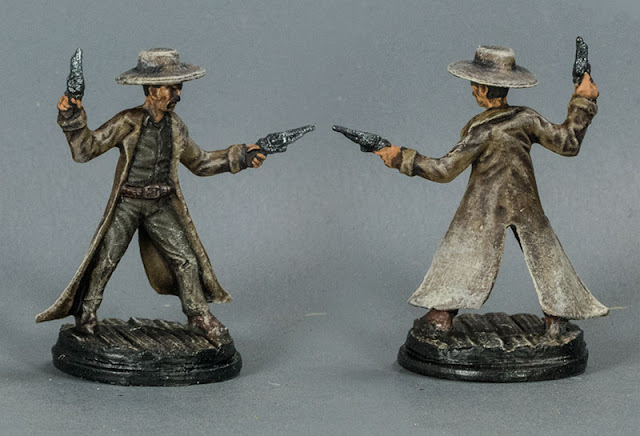 I just wanted mooks, so I painted them up as quickly and simply as I could bear: black primer followed by white zenithal spray followed by white wet-brush followed by greeny ink-wash followed by ivory dry-brush followed by inks for clothes and ground, and that's it. Actual painting time, not including waiting for things to dry, was about twenty minutes I guess. The only thing I don't like about Reaper's plastic Bones figures is the mould lines. They're a real pain to get rid of. New! Improved! Now with added synergy! Get it even more here! Do YOU have a need to randomly determine integers from 1 to 4? 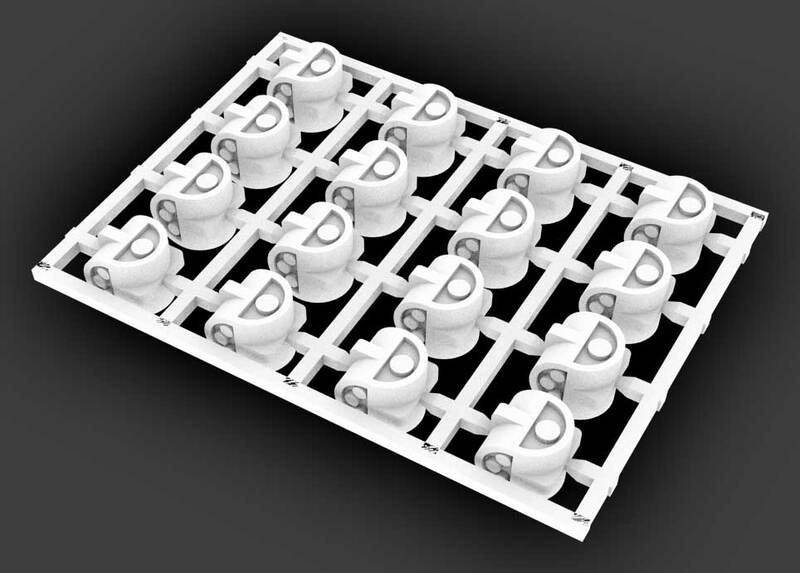 Are YOU sick of impaling your bare feet on caltrop-shaped 4-sided dice in the dark? THEN YOU NEED THIS NEW AND IMPROVED d4!!! 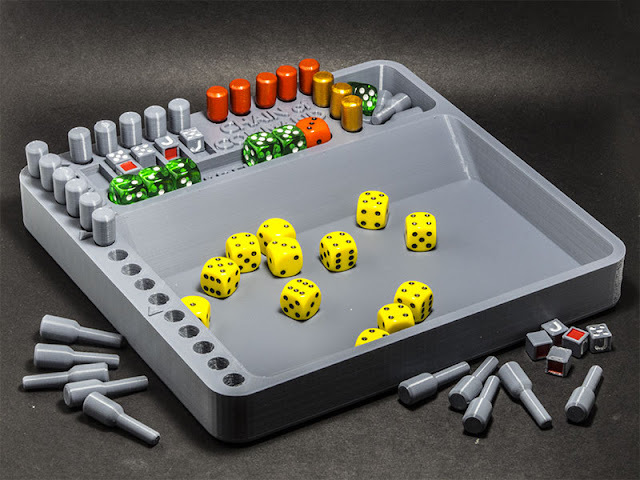 Now you can throw dice that will be the envy of all your peers. [gender] will want you, [otherGender] will want to BE you! Coming now for an unlimited time to a Shapeways printery near you! The dice are 10mm sort-of-cubes — the lugs sticking out on two sides are so that they will come to rest square on the table, and not sit half-cocked on the roundy-bit.